The Piece Hall, a Classical Georgian building, originally opened on 1 January 1779 to trade ‘pieces’ of cloth that were 30 yards long. In those days it opened for just two hours on Saturdays, between 10am and noon. Clothiers sold cloth in 315 rooms ranged around the colonnaded central courtyard, which is like a town square. It is the United Kingdom’s only remaining 18th century cloth trading hall. Throughout the Piece Hall’s history it has never veered from its original purpose as a market place but it has held gatherings, musical events and theatrical productions. The restoration means the Piece Hall can hold more of those and plans exist for it to host a film festival in 2018. It is a Grade-I Listed Building and the first commercial or industrial building in the country to be designated as an Ancient Monument. With the building falling into disrepair sensitive restoration was required. The track record of LDN Architects — whose previous projects include the Scottish Mining Museum, Royal Museum of Scotland and Urquhart Castle Visitor Centre — resulted in it being selected for the Piece Hall restoration. All three levels of the Piece Hall are now accessible to wheelchair users. The courtyard has been restructured and levelled during the restoration, making it more accessible. Stone benches have been introduced, so people can enjoy the piazza-like space, and a water feature has been added, symbolising water flowing in the Yorkshire Dales. The original architect of the Piece Hall is unknown. Several historians think it might have been the Hope Brothers, gentlemen architects and engineers from Liverpool, but others believe there’s a high probability it was Thomas Bradley, the architect of the neighbouring Square Chapel. That building is a cultural events venue with meeting spaces, a theatre, studio that cinema. Visitors can find out about the history of the Piece Hall via guided heritage tours. There are tours aimed at adults and ones for children. Interpretive sessions are also being held for visits by school groups. 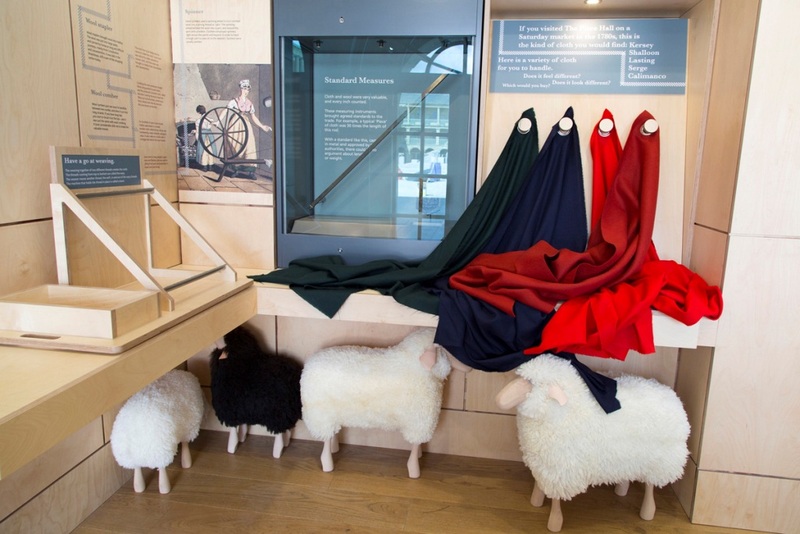 Activities sessions and craft workshops, for people of all ages, bring to life aspects of the wool trade that was so important to West Yorkshire’s economy in bygone times. 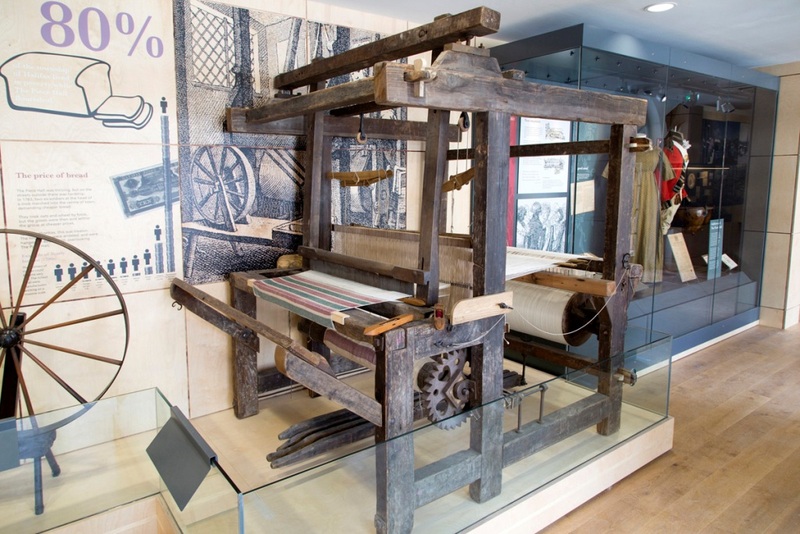 A museum, on the ground level, introduces the history of the Piece Hall and holds a wooden handloom, like those used to weave the cloth that was originally sold, and has interactive digital panels. The first floor brings to life how trading was conducted in a room of original size. On the third floor a room conveys how trade was undertaken via a touchscreen with digital maps. A gallery space exists on the ground floor, exhibiting art and photography. Jake Attree is the current artist in residence. Independent shops and cafes operate from units around the Piece Hall. They open from 10am to 6pm from Monday to Saturday and from 11am to 6pm on Sunday. It also houses an Escape Room, the Gin Lane bar and Elder, a restaurant serving modern British cuisine. The restoration cost £19 million, including £7 million from the Heritage Lottery Fund and support from Garfield Weston Foundation and The Wolfson Foundation. 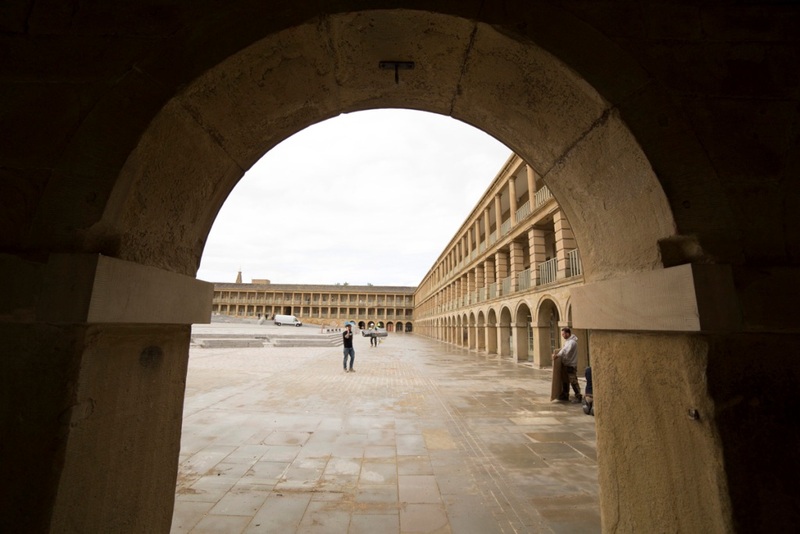 Upon opening the building came under the management of The Piece Hall Trust, a registered charity, which holds a 125-year lease to the building. There’s a genuine buzz around Halifax at present. More than 23,000 people visited the Piece Hall on the day that it reopened. It’s part of a regeneration project that will create an estimated 2,000 jobs. 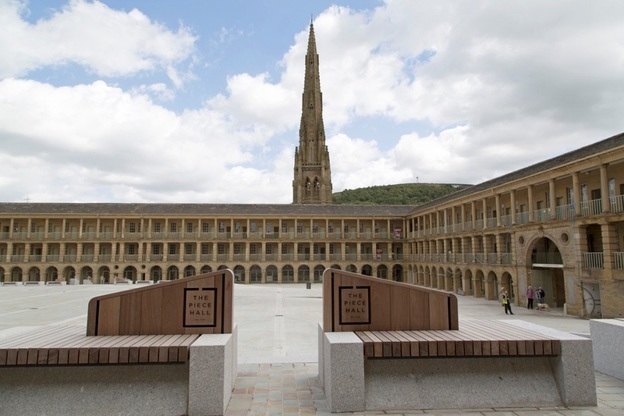 The Piece Hall opens at 7am from Monday to Saturday and at 10am on Sundays. It stays open until late. The Piece Hall is free-of-charge to enter but donations can be made in boxes at the Welcome Centre. 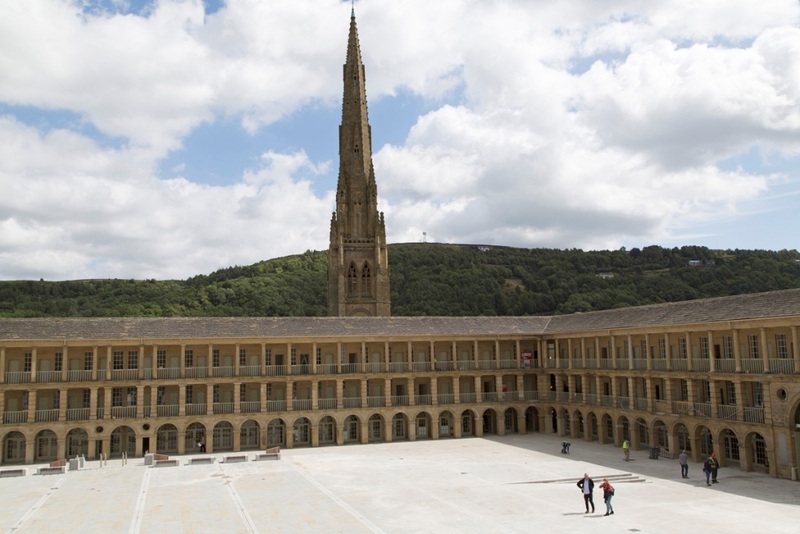 Find out more about Halifax and the surrounding Calderdale region via the Visit Calderdale website. Halifax is in West Yorkshire. 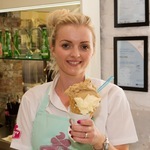 See the Welcome to Yorkshire website for ideas about things to do and see. Find out more about The Piece Hall during free heritage tours, which start at from the Welcome Centre from 13 September 2017. The Piece Hall’s website has timings of the guided tours. What else should I visit? Eureka!, The United Kingdom’s National Children’s Museum is just a couple of minutes’ walk from The Piece Hall. Square Chapel Arts Centre hosts a programme of cultural events and is the location of a café serving quality food and a changing menu of craft beer. Where can I get a good pint? Apart from the bar at the Square Chapel Arts Centre there is a handful of decent pubs in and around Halifax. The Victorian Craft Beer Café (18 – 22 Powell Street) is a cosy spot and has some interesting beers on tap. 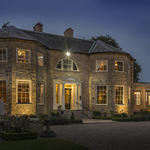 Holdsworth House (Holdsworth Road, Halifax; 01422 240024) is a hotel in a country manor on the edge of town. The house dates from the 17th century. 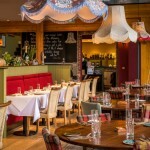 It has mullioned windows, a beautiful Italian-style garden plus a bar.